A Dholi played at a wedding is an auspicious sign and a must for every celebration. But what if you can add a special twist to it? Our Russian Dholi players are the best form at entertainment for your Baraat and beyond. Who doesn’t like seeing these foreigners learning our rituals and actually exceling in carrying them out. Artist On Demand brings you the once in a lifetime opportunity you have been waiting for. We provide the best performers, those who are talented and versatile. Artist On Demand has decades of experience in handling wedding performances. We are one of the most reputed corporations engaged in serving our clients with Dhol players and Bhangra wedding party for many years. we’re known to play modern Punjabi hits that set the ground dancing. With effective running, high overall performance and timely execution of our services, we have earned a big clientele through the years. Reasonable prices are one function that attracts us a large range of customers. Our services also can be custom designed as per the necessities of the clients. We provide Dhol band services to our clients because of what we are well renowned band providers in Delhi and other parts. Over the years our experienced team of professionals has set a benchmark for itself of unbridled creativity in managing sundry events and earned the trust of a diverse range of clients while establishing a national reputation for innovative, influential and effective work. Our expertise and years of experience combined with the enthusiasm of our ever-eager staff to serve you, will assure you of the service second to none. Contact Artist On Demand now for a well renowned and exceptional service. We provide high class performers whose dazzling shows are a must watch. 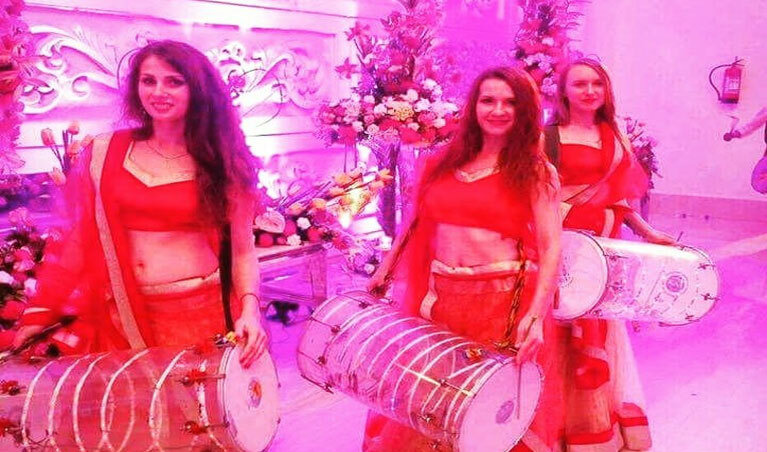 We have a team of Russian Dhol Players, which performs both traditional as well as western Dhol for our clients depending upon the mood and theme of the occasion. The team performs as per the requirements of our clients. We have a team of players who have mastery on Dhol, they can perform both kind of rhythms traditional as well as western Dhol for our clients depending upon the theme of the occasion or demand of the people. So what are you waiting for? Contact us now for a great experience at the best prices. Wishing you a great marriage ! Belly Dancers who will leave you wanting for more!